We're having a big sale on our flower gift sets this week, with price reductions on many of our most popular bouquet gift packs. For example, both the Amethyst and Indian Summer Gift Sets are on sale for just £36.99 with free next working day delivery included, an amazing offer! 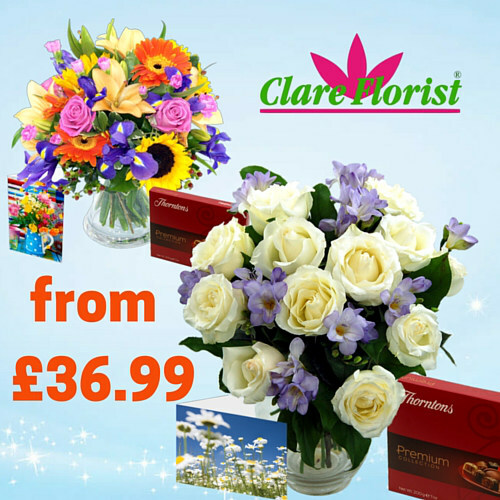 Each Clare Florist Gift Set includes a beautiful bouquet of flowers, a personal handwritten gift card, a box of tasty Premium Collection Thornton's chocolates, and a stylish glass vase. These gifts sets are perfect if you want to send flowers to someone special but want to go above and beyond just a bouquet of flowers on its own. Many of your favourite Clare Florist bouquets are available in gift set form; as well as the afore-mentioned Amethyst and Indian Summer we also have romantic favourites such as the Promised Roses Gift Set, the Twelve Red Roses Gift Set and the Love - 20 Red Roses Gift Set. We also have gift sets designed especially for the birth of a new baby (in these we substitute the chocolates for a cute and cuddly teddy), gift sets for mums and gift sets to send Wedding congratulations. No matter what the occasion is, we have a gift set to suit. Don't forget, each and every single one of our luxurious gift sets comes inclusive of free next working day delivery or you can upgrade to Saturday or Sunday delivery for a small surcharge.